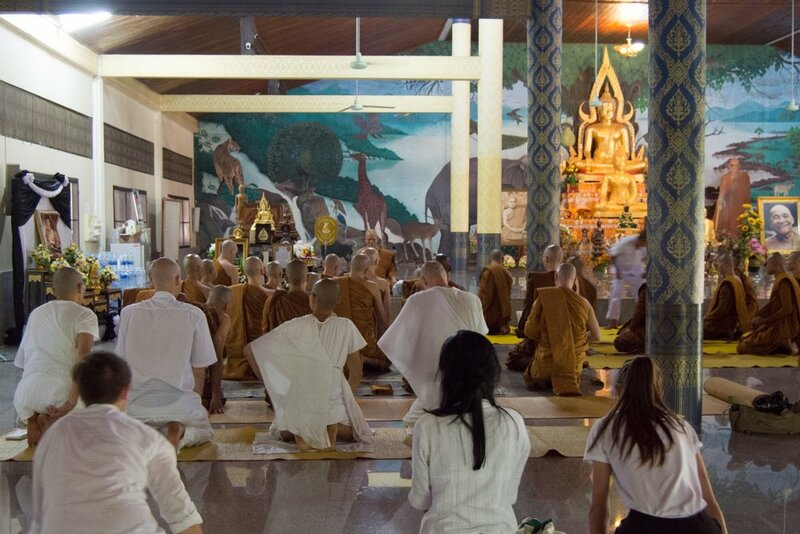 On December 31st, 2017 the Sangha and the laypeople of Wat Pah Nanachat gathered in the main Sala to meditate into the new years and chant "parittas", the traditional protective chants as a blessing for the all sentient beings. 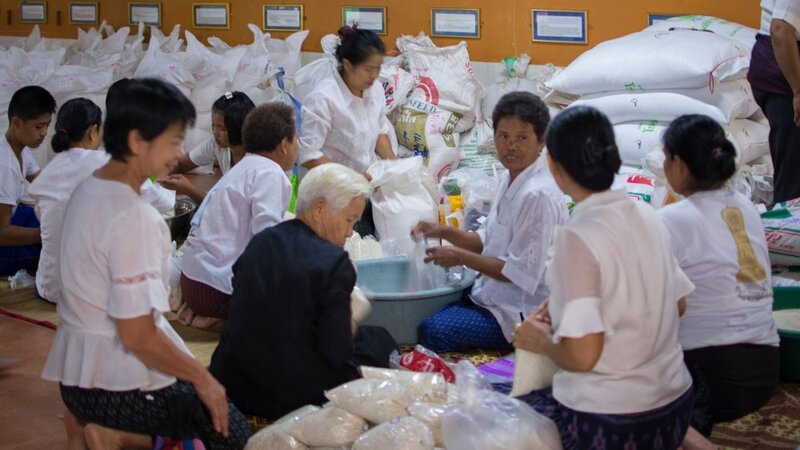 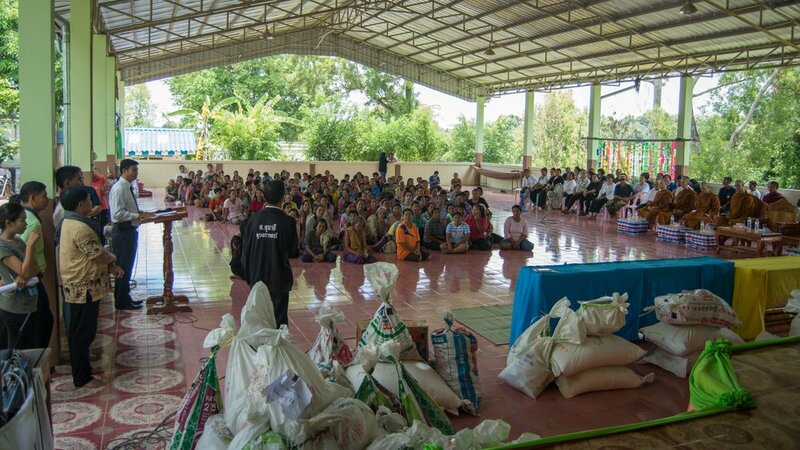 With the generous help and sharing of rice supplies by the farmers of Bung Wai Village (Wat Pah Nanachat's main supporters), and many donors from town, it was possible to donate many tons of rice to the villages around Wat Pah Bahn Jaeng Noi in Yasothorn province, who had been heavily hit by the flooding of the Chee River, that destroyed thousands of acres of rice paddies around the monastery. 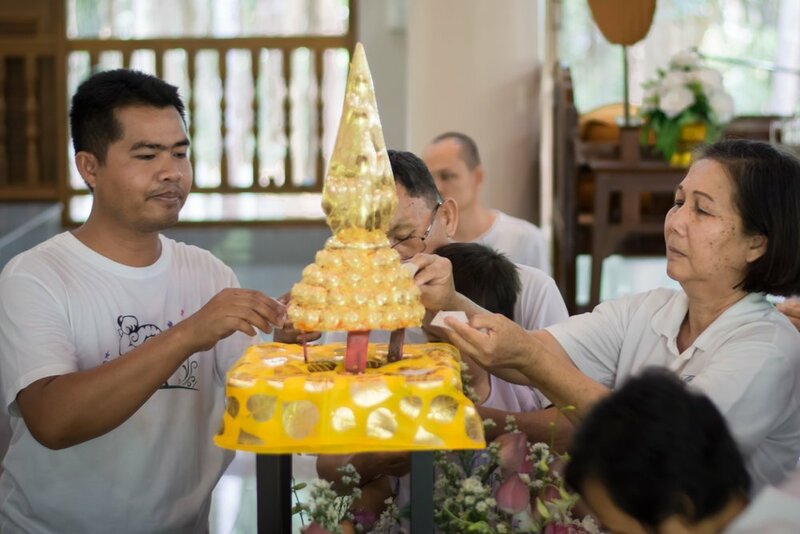 Tan Ajahn Boonrueang, the abbot of Wat Pah Bahn Jaeng Noi, a disciple of Luang Por Liem helped to coordinate the offering in skilfully choosing some of the worst hit families, schools and village centers. 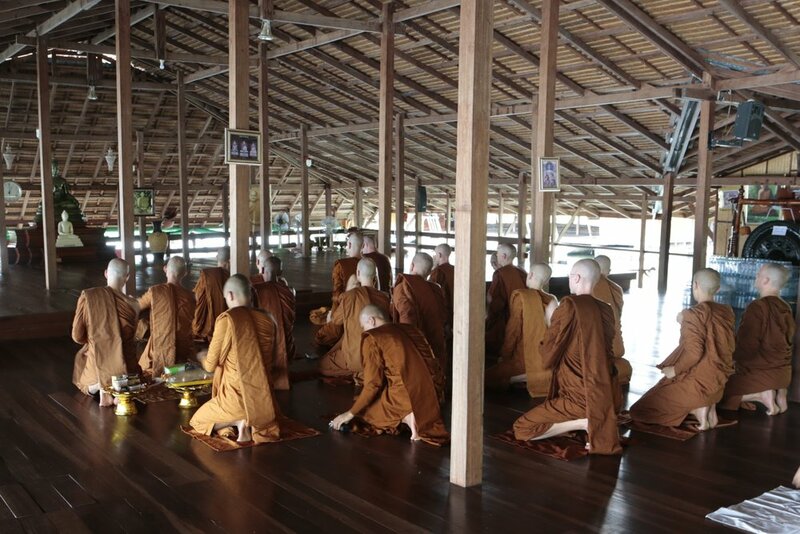 When travelling across the country, the Sangha of Wat Pah Nanachat usually leaves the monastery early in the morning and then, as it gets light, stops by at a local market place on the road for collecting almsfood. 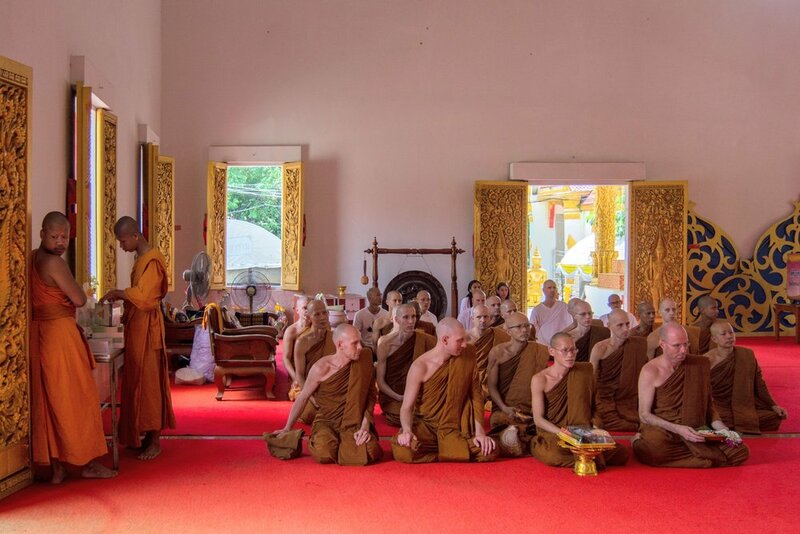 These occasions are usually beautiful expressions of faith of the local villagers that rush out to give food spontaneously when the monks turn up by surprise. 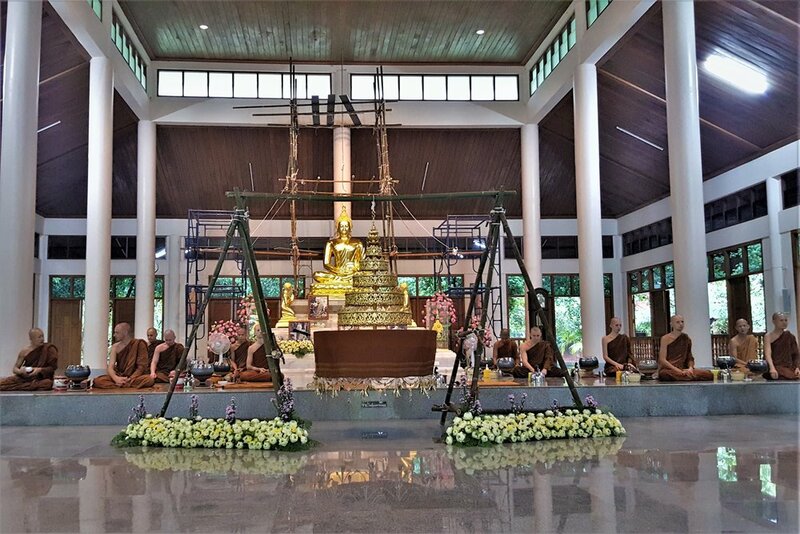 The following photos were taken by our monastery secretary Thirawud Cholasuek (Ton) on August 30, 2017 in Ampher Kueang Nai, Ubon Rachathani Province. 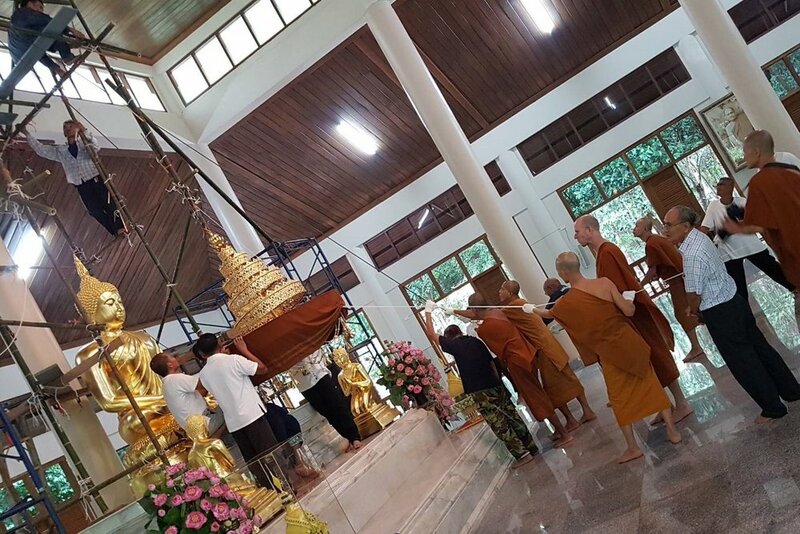 At the beginning of the rains retreat ("pansah") the Sangha of Wat Pah Nanachat goes on a tour to pay respects to senior monks in the area. 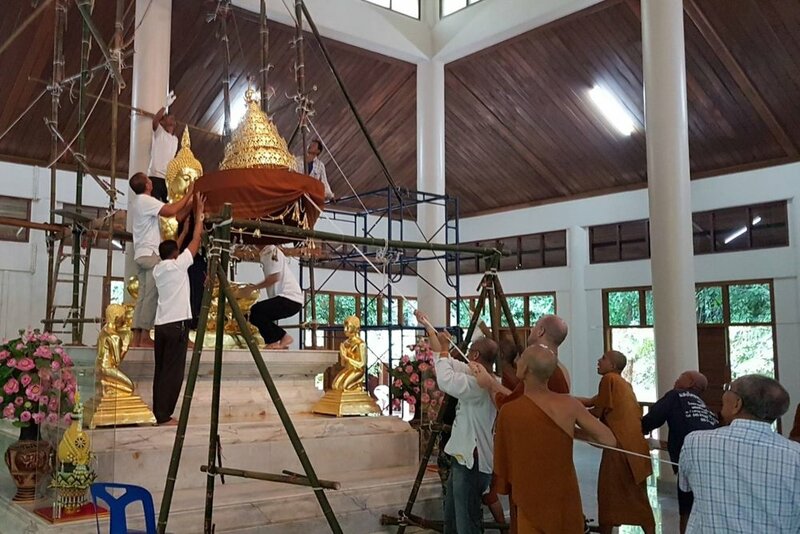 Usually this includes both the senior monks from the Sangha administration and the forest monks of the Wat Nong Pah Pong group of monasteries. 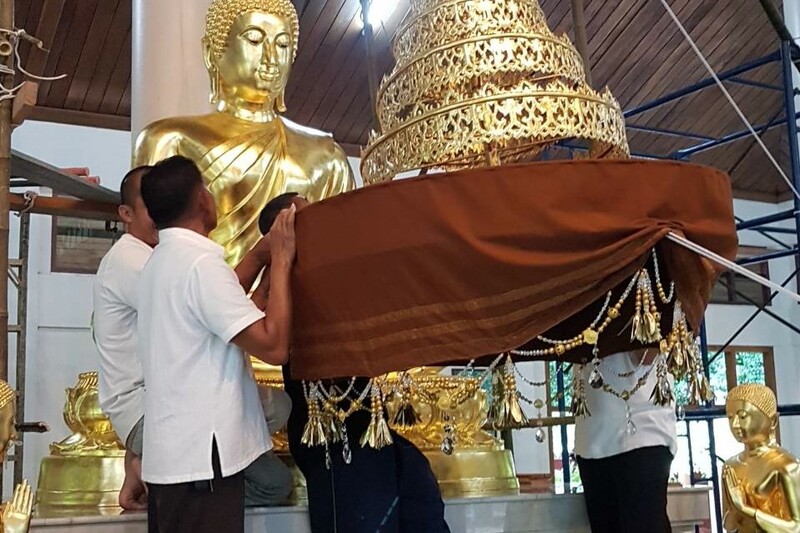 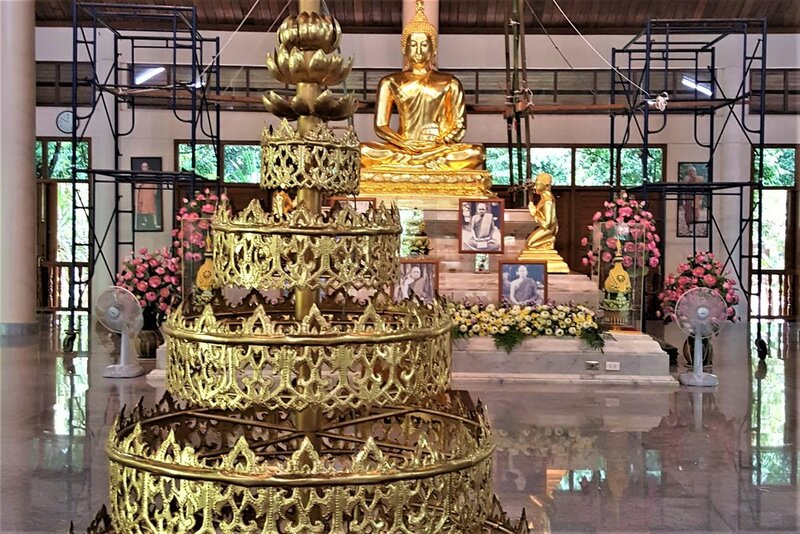 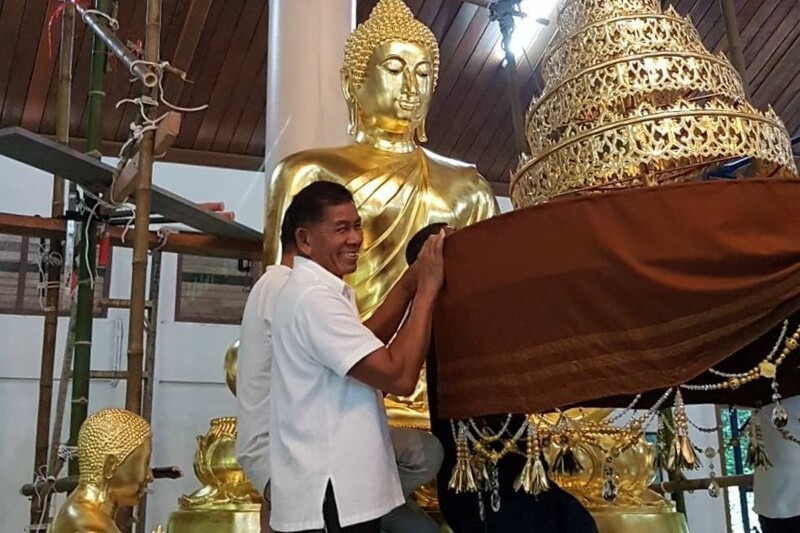 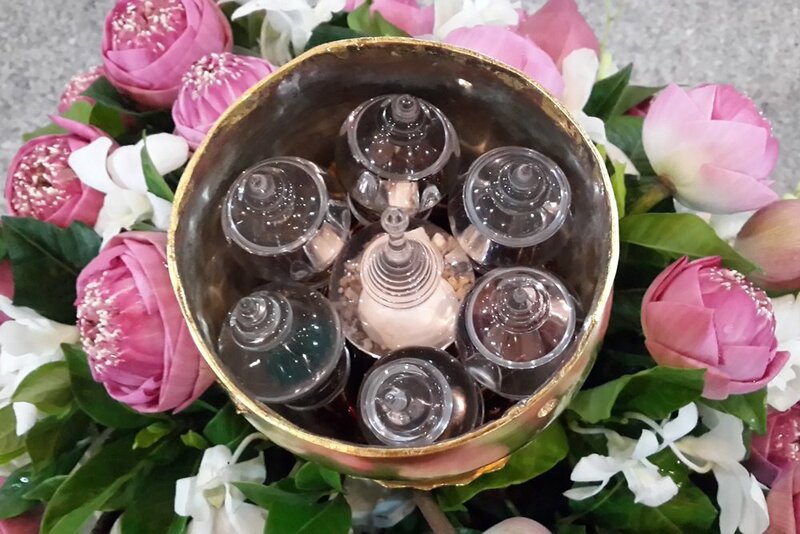 This year started with a special trip to pay respects to the Buddha's chest bone relics enshrined in the Chedi of Phra That Phanom in Nakhorn Phanom, one of the most venerated holy-sites of northeast Thailand and Laos. 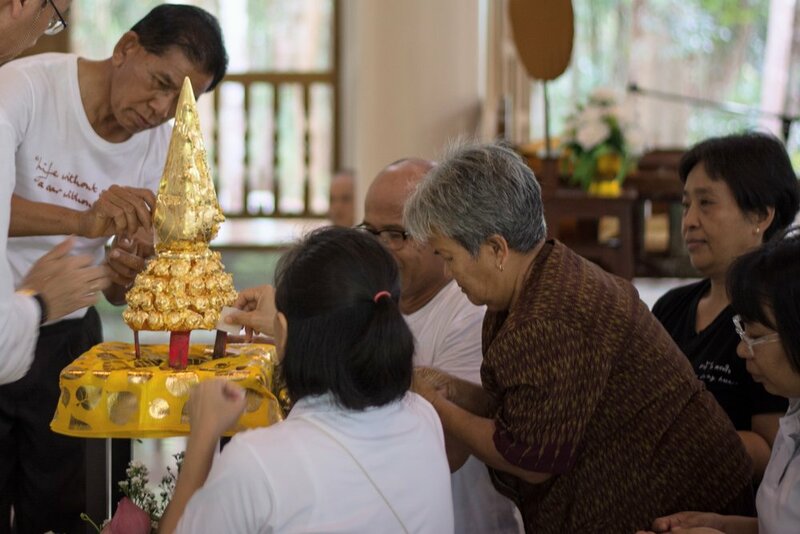 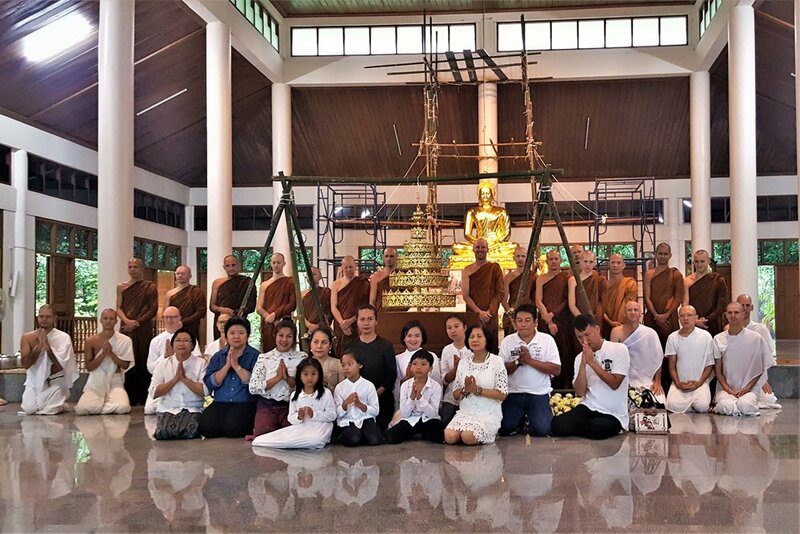 At the end of June 2017 Wat Pah Nanachat hosted a temporary novice ordination program with children from various international schools in Bangkok, lead by Ajahn Bhanuwat from Wat Phra Ram Gao (Rama 9th Golden Jubilee Monastery) in Bangkok. 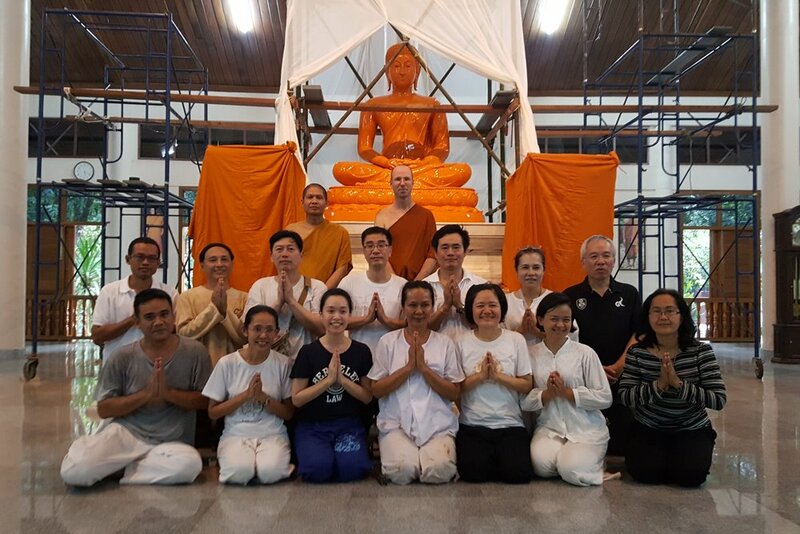 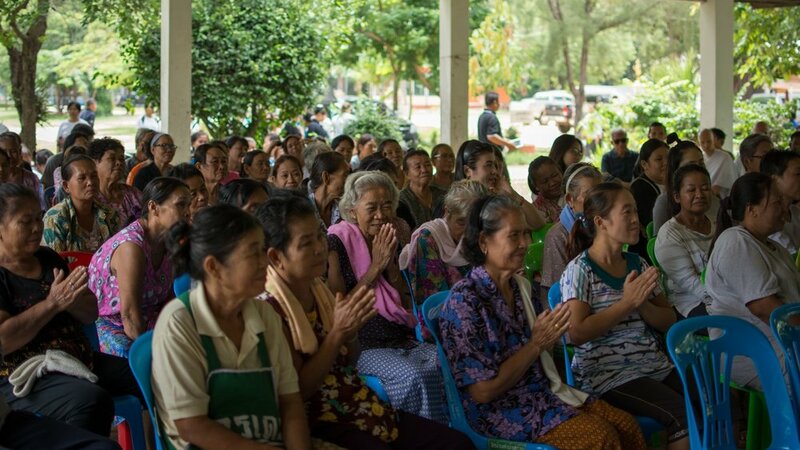 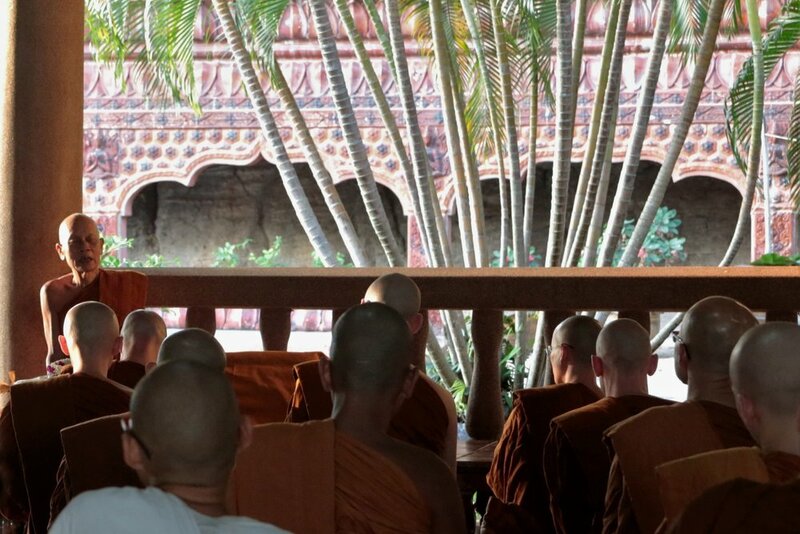 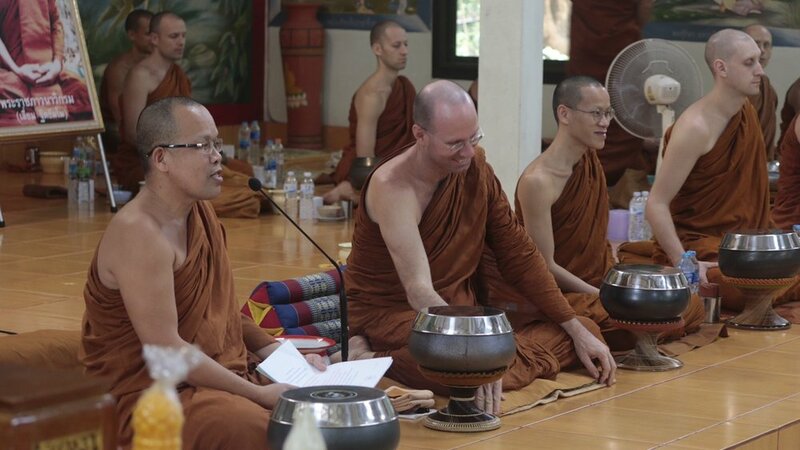 The group joined with the regular routine of Wat Pah Nanachat for three days, and received various instructions into sitting and walking meditation, broom-making and various typical activities of forest monks. 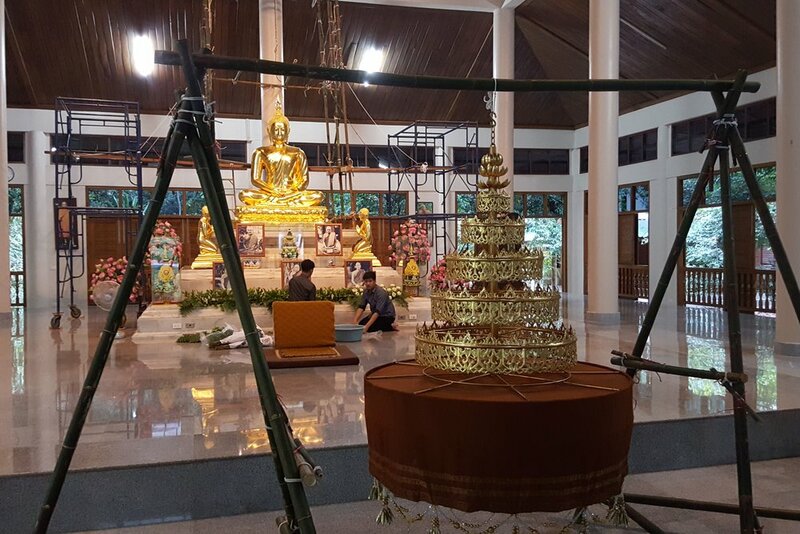 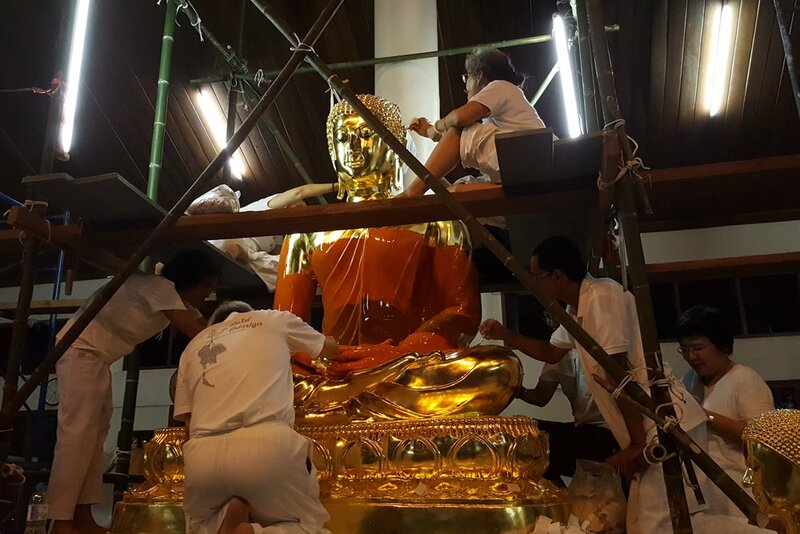 After gold-leafing the main Buddha statue "Phra Buddha-Karuna" of Wat Pah Nanachat, a classical ceremonial umbrella to crown the head of the Buddha image was generaously offered to the monastery on April 28, 2017, protecting the image from dust and various droppings from the ceiling, and enhancing the shrine with a warm traditional feel to it.